The Peoples Democratic Party [PDP] presidential Aspirant, Alhaji Atiku Abubakar, has accused Vice President Yemi Osinbajo of running a self-indicting campaign ahead of the 2019 polls. Atiku, said this while reacting to a charge by Vice President Yemi Osinbajo on Nigerians to ignore empty promises. He spoke while carrying out a door-to-door campaign in Lagos last Sunday. 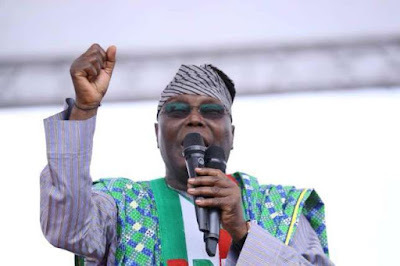 But, Atiku speaking through his media assistant, Paul Ibe in a statement, said by failing to deliver on the 2015 election promises, the Vice President has told Nigerians to reject the All Progressives Congress, APC, in 2019. Ibe said: “Osinbajo is running a self-indicting campaign for his boss and himself. How can they ask Nigerians to beware of empty promises when they are the ones that made the promises? “Come on, do these people think Nigerians are fools? They promised to create three million jobs in a year but we are witnessing job losses in millions since they took over. They promised to make a naira equal to the dollar but a dollar is almost N400 today. “They promised to bring insecurity down on its knees but as I am talking to you now, Zamfara is on fire. Soldiers in large numbers were recently killed. One of our finest former Defence Chiefs, Air Marshal Alex Badeh was a few days ago killed very close to the nation’s capital. He called on eligible voters to trust the PDP flag bearer with their mandate, stating that after making a success of his public office career office as well as his foray in business, Atiku would not disappoint in replicating the same feat if voted into power. “In Let’s Get Nigeria Working Again (Atiku’s blueprint), our candidate will forestall hope into Nigerians and make Nigeria proud again. We are asking Nigerians to trust this man who has proven beyond doubt, his capacity to deliver at the big stage. He is not a converted democrat. He is born into democrat, not someone who converted because the old road was blocked,” he added.